The latest Marvel film, Avengers: Infinity War is one of the most ambitious comic book adaptations of all time. It brings together superheroes from all parts of the Marvel Universe, uniting against the super villain Thanos. The plot and even who is definitely in it has been kept under wraps, with the cast being sworn to secrecy. We do know it has the most amount of superheroes in a film at one time, but no one seems to know how many. When we say no-one - even the cast struggled to answer the question at a special fan event in London. "I've no idea, no, but I think a lot?" said Benedict Cumberbatch who reprises his role as Dr Strange. If the poster is anything to go by, yes Benedict, it is a lot, there are at least 22 superheroes on it, but we know there are many more in the film. Avengers: Infinity War is the culmination of 18 movies over the past decade. That is a lot of storylines to bring together from films including Avengers: Civil War, Black Panther, Guardians of The Galaxy, Dr Strange and Thor. Wakanda's Princess Shuri may have genius-level intellect but the actress who plays her, Leticia Wright couldn't help us out either. "Erm, I've heard it's 64, something like that. I don't know, something crazy like that," she said. "I don't know, it's got to be somewhere between 30 and 40, that sounds like a realistic number right?" Sebastian Stan AKA the Winter Soldier guessed. "I was told 32, but I don't know," said Paul Bettany who plays Vision. Why does no-one know? Well surely the two men who directed this film can set us straight, Anthony and Joe Russo. "There's a lot. 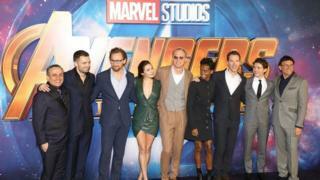 I counted the poster today and minus the Black Order there were 24 people on the poster," Joe said. "But maybe I miscounted. I was in the middle of an interview. We need someone to count and tell us." Well, previously, Chris Hemsworth who plays Thor, said he thought it was 76 in total. Unfortunately, we won't know until the film comes out, but in a universe with 756 superheroes, Thor might be on the money. Avengers: Infinity War is released on 26 April.